The fantastical adventures of unlikely heroes, Finn & Jake, buddies who traverse the mystical Land of Ooo and encounter its colorful inhabitants. 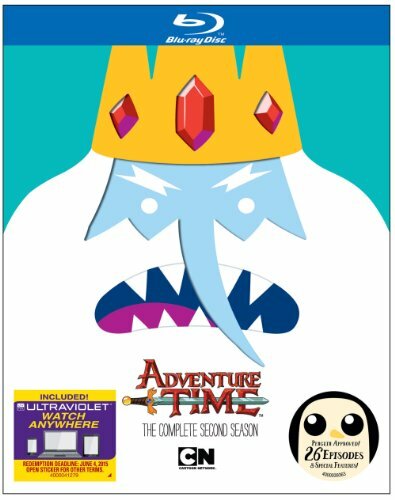 Complete with absolutely algebraic bonus content created by series creator Pendleton Ward, including a featurette filmed by Ward that provides exclusive access to and interviews with members of his talented show team, as well as episode commentaries for all 26 season two episodes from Ward and the Adventure Time team. Adventure Time Makes Its Blu-ray Debut; Season 1 Blu-ray Also Available Same Day! Cartoon Network announced today the first - and second - Blu-ray(TM) release for its hit comedy series, Adventure Time , as the company will bring the first two seasons of the Emmy(R) Award-nominated animated series to Blu-ray on June 4. Adventure Time: The Complete Second Season will debut on both DVD and Blu-ray, complete with absolutely algebraic bonus content created by series creator Pendleton Ward, including a featurette filmed by Ward that provides exclusive access to and interviews with members of his talented show team, as well as episode commentaries for all 26 season two episodes from Ward and the Adventure Time team. Also that same day, Cartoon Network will release Adventure Time: The Complete First Season on Blu-ray, bringing that fan-favorite home video release to the high-definition market with stunning HD-quality audio and video. Both season one and season two Blu-ray titles will also include a free Ultraviolet HD digital copy for each episode. Both Adventure Time: The Complete First Season and Adventure Time: The Complete Second Season Blu-ray releases will be available for the suggested retail price of $32.07, while the two-disc season two DVD will be priced at $26.95. "Adventure Time fans are the best! They are totally passionate - and vocal - about what they want, and we know from their tireless online commenting, both full season sets and Blu-ray releases have been at the top of their lists of demands," said Erik Resnick, vice president of Cartoon Network Enterprises, the home entertainment division of the network. "Their patience has paid off as we deliver both with today's announcement of the season two release and our first two Blu-ray and Ultraviolet releases. Add to that really great bonus content created by Pen Ward and the show team on the season two set, and I expect we'll have some pretty happy Adventure Time fans come June." As one of Cartoon Network's most popular series, Adventure Time continues to thrive with a massive on-air audience, very active fan base and strong retail presence. The television series' popularity continues to grow as the recent season five premier was the #1 show for the day with boys 2-11, and kids and boys 6-11, 9-14 and 12-17, and the show consistently ranks number one its time slot with boys 6-11 and boys 9-14, according to Nielson Media Research. Socially, the brand builds its fan base virtually every day with more than 6 million fans on Facebook, popular Adventure Time games on CartoonNetwork.com, and innumerous fan sites and blogs devoted to the show. In addition, Adventure Time's presence at top retailers across the country is continually expanding though the property's comprehensive line of hard and soft consumer products which includes toys, apparel, accessories, interactive games, youth electronics, comic books, posters and much more. Created by Ward and produced by Cartoon Network Studios, Adventure Time leads viewers on the fantastical adventures of unlikely heroes, Finn & Jake, buddies who traverse the mystical Land of Ooo and encounter its colorful inhabitants. New episodes from the fifth season of Adventure Time premiere on Monday nights at 7:30 p.m. (ET/PT) on Cartoon Network with replays throughout the week. Cartoon Network (CartoonNetwork.com) is the #1 U.S. television network among boys 6-11. Currently seen in 99 million U.S. homes and 194 countries around the world, Cartoon Network is Turner Broadcasting System, Inc.'s ad-supported cable service now available in HD offering the best in original, acquired and classic entertainment for kids and families. In addition to Emmy-winning original programming and industry-leading digital apps and online games, Cartoon Network embraces key social issues affecting families with solution-oriented initiatives such as Stop Bullying: Speak Up and the Move It Movement.